Anji Mountain Bamboo Rugs are made from 100% quality bamboo from the remote Anji Mountains in China, these rugs are considered one of the finest bamboo rugs. Anji Rugs are easy to clean and ecologically friendly that provide a beautiful accent to any style of flooring in any area of the home. 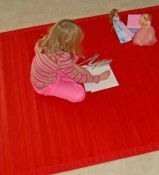 Manufactured in China, the bamboo in these rugs is machine planed, sanded, then hand sanded once again to insure a high quality finish. All the bamboo that is used is harvested, processed and assembled in China. The bamboo is carbonized which means that water and oils have been removed naturally, and then it is kiln dried to prevent warping and cracking. These steps insure that the rugs will withstand the dry heat inside your home during the winter or an arid, desert-like climate. 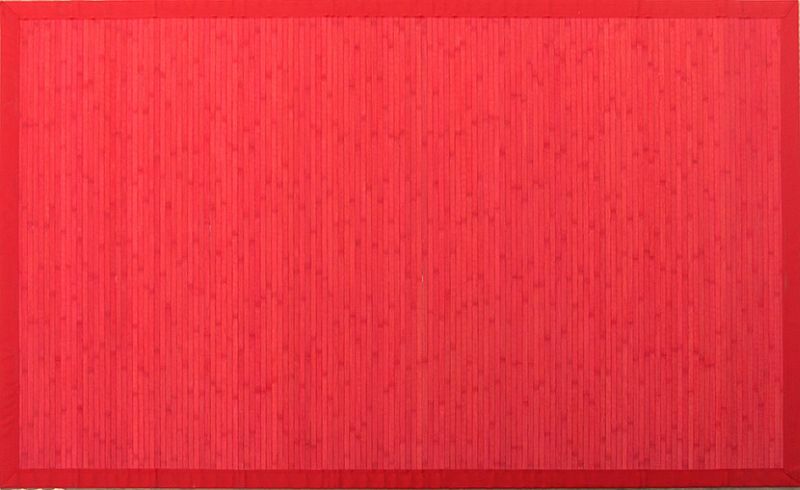 Each Contemporary Red Bamboo Rug has been created with a color-coordinated poly border that will last longer and be more stain resistant than a cotton border. Also, each border is micro-stitched and has mitered corners for an attractive finish and better wear. This rug measures 7ft x 10ft.